In this episode, Robert and I applaud Upworthy’s decision to move from clickbait articles to longer-form, high-quality original content, and ponder the reasons behind this move. Next, we share our take on a long-running debate: Should you produce all content internally or outsource at least some of it to agencies? We scratch our heads over an article that attempts to explain what branded content is, but fails to bring any more clarity to this often-misunderstood marketing concept. Finally, we doubt that consumers are furious with brands for capturing data about them, as a new University of Pennsylvania research study claims. Rants and raves include a poorly-researched and written article about the ROI of content marketing and native advertising and an outstanding TED Talk about autism. This week’s This Old Marketing example of the week: Kraft Music Hall. How Upworthy is using data to move beyond clickbait and curation (5:08): After hiring Amy O’Leary from The New York Times, Upworthy has started employing user data to create long-form original content. I love Upworthy’s content marketing mission statement on Slideshare, which is the best I’ve ever seen. 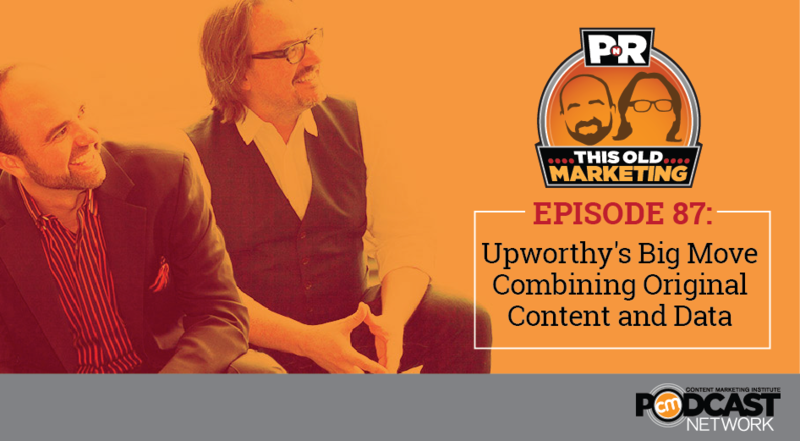 Robert and I agree that a big driver behind Upworthy’s content pivot may be Facebook’s new algorithm, which rewards time on page. Or it could have been Upworthy’s plan to pivot to this new content model all along. Who should handle your content marketing? (16:13): Is content a DIY project, or is it a job better left to professionals, Rebecca Lieb asks on iMedia Connection? Few brands have the staff, time, and tools to meet all their content marketing demands internally. In my opinion, it always depends on the organization and its needs; usually, a combination of the two works best. What’s often missing in brand-agency relationships is a deep understanding of how content fits into the organization’s strategy, Robert observes. It’s just advertising, Dillweed (24:36): What exactly is branded content? Mark Duffy from Digiday’s Copyranter blog takes on this popular, but often-misunderstood marketing term. After debunking a number of popular definitions, he concludes: It’s all just advertising. Robert and I agree that this opinion piece is just a thinly veiled attempt to get attention and doesn’t bring any more clarity to the concept. Why Americans are secretly furious with marketers (30:35): Marketers are misrepresenting a large majority of Americans by claiming that they willingly provide personal information as a trade-off for benefits they receive. So claims a new University of Pennsylvania study recently cited by Mark Schaefer on his GROW blog. Robert cautions that survey data usually describes a set of averages; actual consumer behavior and sentiments cover a much wider range than this skewed study would suggest – including apathy. This Old Marketing is sponsored by Acrolinx, a platform that helps the world’s most recognized brands create more engaging, more readable, and more enjoyable content. 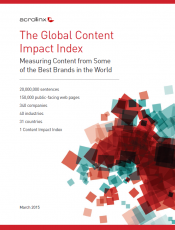 It’s offering a new report, The Global Content Impact Index, which shares the results of its detailed analysis of the world’s content. Using a proprietary linguistic analytics engine, its software reviewed 150,000 individual, public-facing web pages from 340 companies around the world. That represents 20 million sentences and over 160 million words. The results were surprising. Learn more at http://bit.ly/acrolinx-global-index. Robert’s rant: When Robert learned that Harvard Business Review published an article that compares the ROI of content marketing and native advertising, he was initially excited. Here’s a piece in his favorite business publication about a topic that’s near and dear to his heart. But reading it deeply disturbed him, because of the way in which it butchers a definition of content marketing, presents a misleading comparison chart, and plays fast and loose with data from several marketing research studies. Joe’s rave: I love this TED Talk on the forgotten history of autism and why it is so frequently diagnosed today. What’s the content marketing connection? In this excellent video, Steve Silberman explains how the movie Rain Man transformed the public’s perception of autism as something negative to something more positive, and mobilized the medical community behind it. That makes it a great example of the power of storytelling. 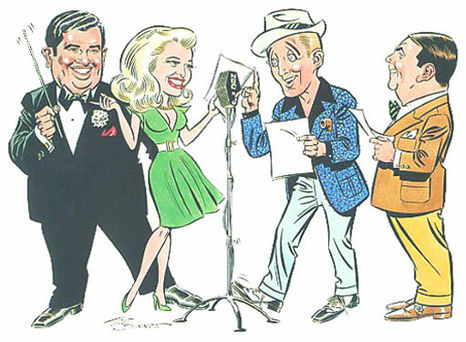 Kraft Music Hall: The Kraft Music Hall was a popular musical variety program, featuring top show business entertainers, which aired on NBC radio and television from 1933 to 1971. Paul Whiteman, the “king of jazz,” was the first band leader, and was arguably the first American music superstar. From 1939 to 1946, Bing Crosby was at the helm of this beloved radio show. In 1958, Kraft Music Hall made the leap to television, where it ran on NBC until 1971. Kraft kept the advertising completely separate from the music portions of the show. It always used a separate announcer, not one of the show’s performers, to deliver the commercial messages, which were 30 seconds or less in length. During its 38-year run, the show survived numerous changes in performers – a tribute to Kraft’s commitment to delivering a high-quality music experience. Kraft Music Hall is an outstanding example of #ThisOldMarketing.